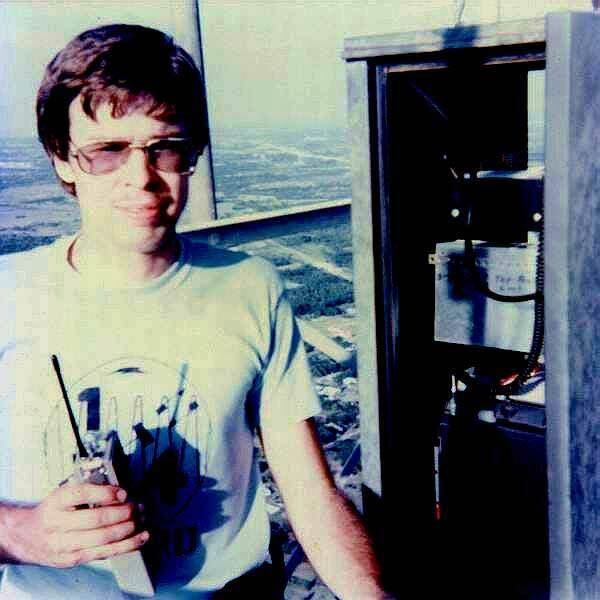 This is a picture of a very young-looking Ken Noblitt, N5UA, standing next to the N5FL/R cabinet in the 1,100-foot platform on the KXTX Channel 39 tower. He is holding his Henry S-2 220MHz talkie with a custom-installed 16-digit PIPO touchtone pad installed by Louis Bancook, K5UUT. Image taken December, 1981. This is a picture of a very young-looking Chuck Adams, N5UN, wearing a snazzy "Quarter Gigger" (220 MHz) T-shirt and standing next to the N5FL/R cabinet at the 1,100-foot platform on the KXTX Channel 39 tower. 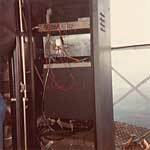 Partially visible in the cabinet from top to bottom is the 224.1 MHz repeater (still in operation today), a box containing the 443.5 MHz to 146.46 MHz "controller", and the Johnson 146.46 MHz remote base radio which was connected to the 443.500 MHz repeater (not visible in this view). It is interesting to note that after the Johnson 146.46 MHz radio was retired from service at Cedar Hill, it was reincarnated as the 146.94 MHz repeater in Fort Worth for a number of years. 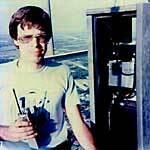 It was retired from full-time service in 1991 and is still used as a backup and portable repeater in Fort Worth. Image taken December, 1981. 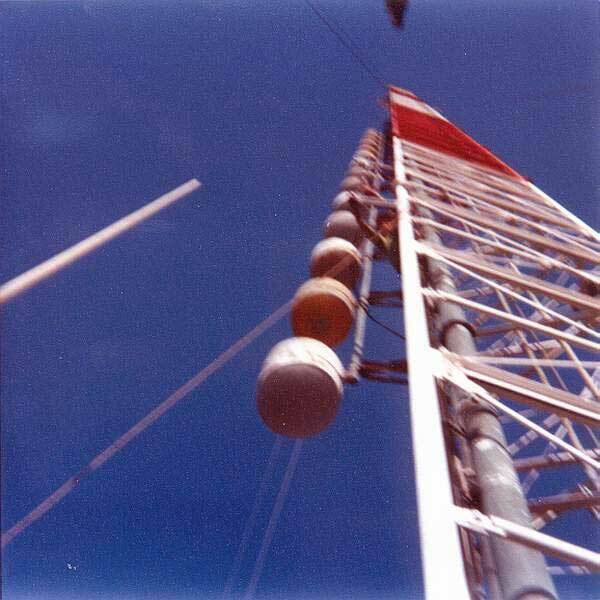 This is a very interesting picture taken looking up from the 1,100-foot platform at the KXTX Channel 39 tower at an FM broadcast antenna array. 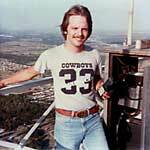 If you look closely, you will see Johnny Stigler, WA5ZRQ, sticking out from the tower. He is working at the base of the Jack Perkins, W5URH, "URH-244" 220 MHz antenna that was used at the 224.100 MHz repeater transmit antenna. 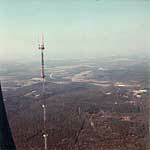 This picture was taken the day the 220 MHz repeater (224.100 MHz) was installed. Image taken October, 1981. 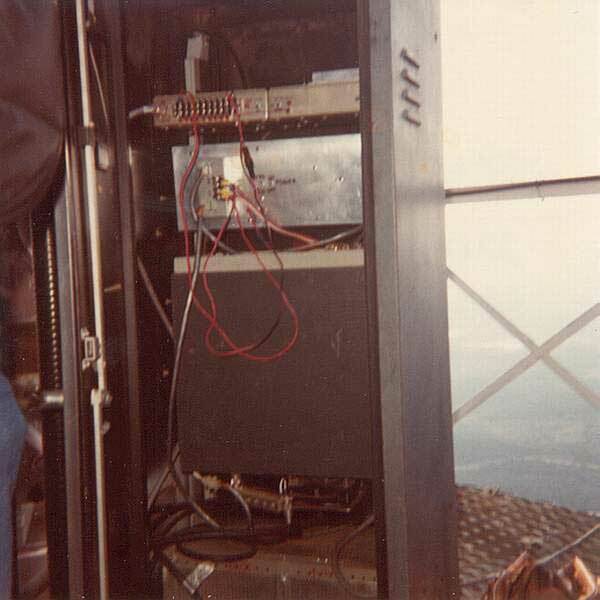 This is a view of the back side of the N5FL/R cabinet on the 1,100-foot platform on the KXTX Channel 39 tower. 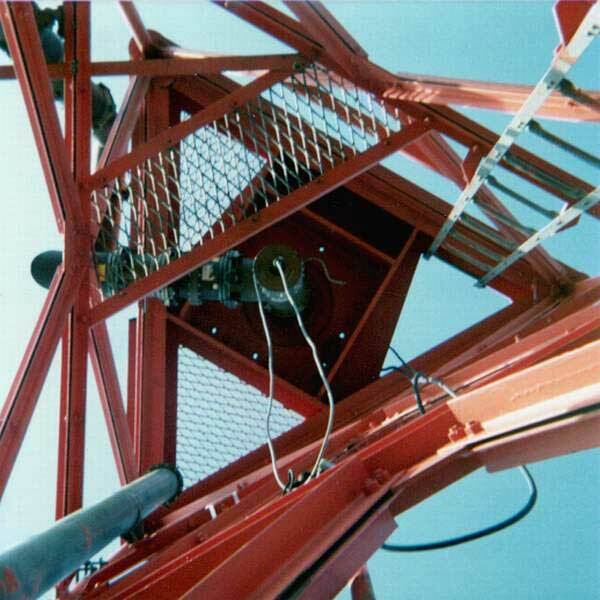 The equipment visible from the top down is the 224.1 MHz repeater, the 443.5 MHz repeater to 146.46 MHz remote base "controller" and the power supply. Barely visible to the left of the picture is a very cold Ken Noblitt, N5UN, holding the cabinet door open against a 30mph "breeze." Image taken February, 1982. This is a view from the 1,500-foot level of the KXTX Channel 39 tower at Cedar Hill looking northeast toward downtown Dallas, although downtown Dallas is not visible through the haze. This is the tower that fell in 1996 and has since been rebuilt. 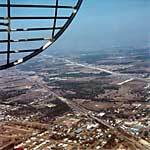 The Armadillo equipment had been moved to another tower at Cedar Hill several years prior to the tower falling. Ken Noblitt, N5UA, and Chuck Adams, N5UN, rode the elevator all the way to the top, got out, and climbed the ladder until they got to a sign that said "DO NOT ENTER THIS AREA WHILE TRANSMITTER IS ON - DANGEROUS RF RADIATION HAZARD." They took this and a couple of other pictures and then left immediately. The RF field was so high that N5UA's electronic camera refused to operate; N5UN took this picture using a manual camera. Image taken February, 1982. This is a view looking up at the base of the TV antenna on the KXTX Channel 39 tower at Cedar Hill, 1500 feet. Image taken February, 1982. 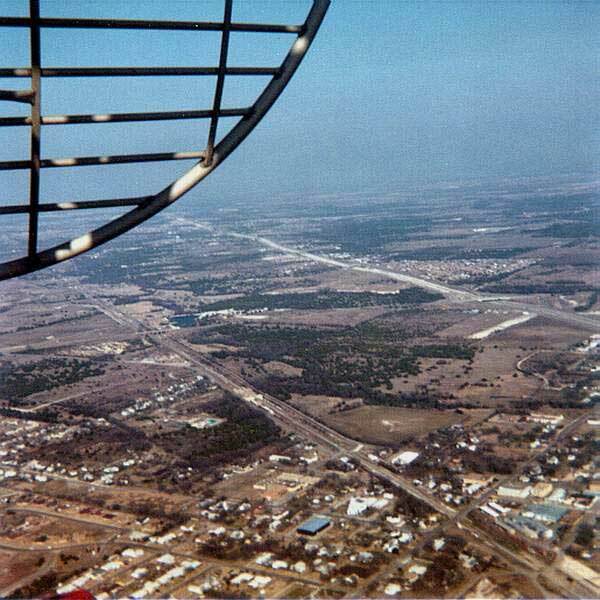 This picture is a view looking north-northwest from the 1,500-foot level of the KXTX Channel 39 tower. 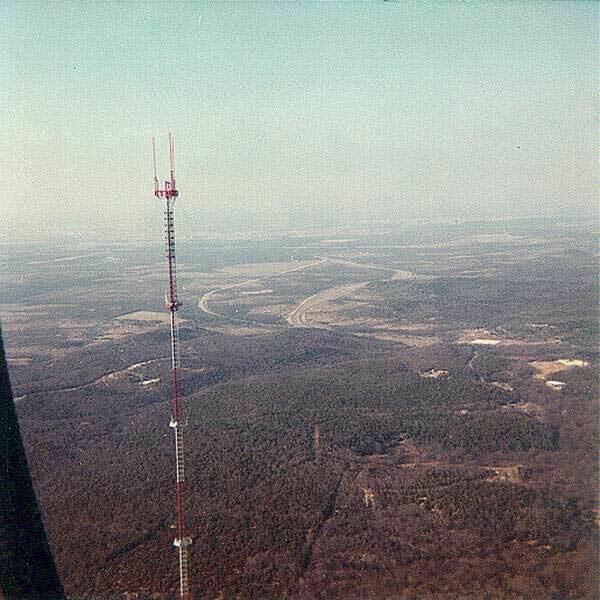 The tower in the left of the picture was known at this time as the "SJR" tower, which is the same height as the Channel 39 tower (1,500+ feet). As you can see, we are looking straight across at the SJR candelabra. 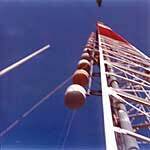 The SJR tower had 3 platforms used for two-way radio; the top two were later removed to make room for more FM and UHF-TV brodacast antennas. Image taken February, 1982.